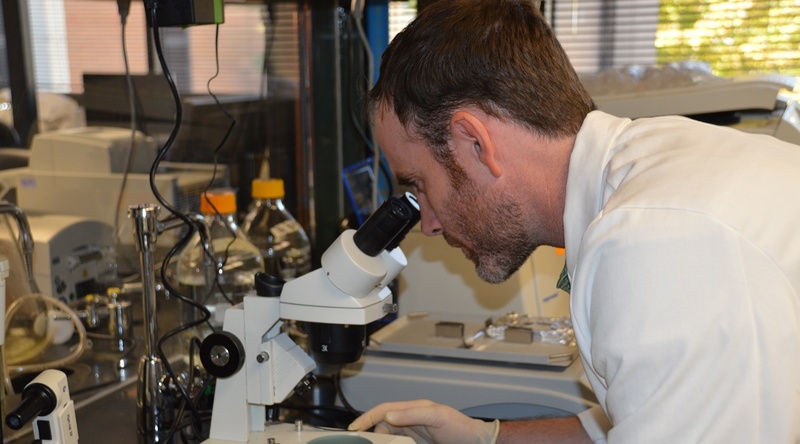 OMRF scientist Bob Axtell, Ph.D., has received a four-year grant from the National Institutes of Health to study a rare autoimmune disease called neuromyelitis optica (NMO). The grant, awarded by the National Institute of Allergy and Infectious Diseases, will provide Axtell with $2.8 million to study NMO and investigate its similarities to other autoimmune diseases, particularly multiple sclerosis. Another primary focus will be to study why medications for multiple sclerosis, namely interferon beta, actually make NMO symptoms worse. NMO, like all autoimmune diseases, occurs when the immune system attacks its own healthy tissues as if they were harmful invaders. In NMO, the body primarily attacks the optic nerves and spinal cord, resulting in inflammation that can cause severe pain and vision loss. In severe instances, NMO can invade regions of the brain or the brain stem. Interferon is a protein naturally produced by the body that is released in the cells in response to a virus and helps to prevent the virus from replicating. In MS, interferon levels are lower, requiring interferon beta treatment to bring the levels back to normal levels. But in NMO, the interferon levels appear to be elevated, possibly explaining why treatment with interferon beta worsens symptoms. With that knowledge, said Axtell, researchers hope to develop new therapies for NMO. There are currently no approved therapies for the disease. The grant, 1 R01 AI137047, is funded through the National Institute of Allergy and Infectious Diseases, a part of the National Institutes of Health.